Join us as we sleep out to raise funds for the homeless in Port Kembla. The sleep out has been designed with families in mind. 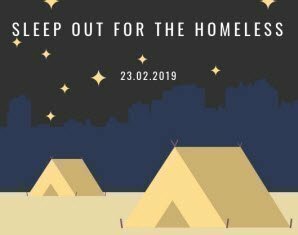 It will be a “soft sleep out” – small tents and sleeping bags are permitted and the event is in February while it is still warm. This will be a great night where the community can come together and connect with friends and family. The sleep out will commence at 6:00pm on the Saturday night and finish at 8:00am Sunday morning. On the night Emmanuel Bakenga who is leading the Hope Kitchen in Port Kembla will be speaking educating people on the hardships that he has faced. Emmanuel was a refugee in Uganda. The sleep out aims to bring attention to homelessness in the Illawarra and give Helensburgh the opportunity to support the homeless in Port Kembla. The funds raised through the sleep out will support the Hope Kitchen in Port Kembla. This will be used to purchase food and provide follow up counselling and support. either homeless, living in boarding house or pub accommodation. Many of the people who attend have mental illness, intellectual disabilities, and drug and alcohol issues. For many of these people it is the only hot dinner they receive in a week. PLEASE NOTE: Charles Harper Park is an alcohol free zone.